The Department of Physics and Astronomy is located primarily in the Natural Science Building at the University of Louisville ("A" on the map below), although there are also researchers in the Shumaker Research Building and Ernst Hall. 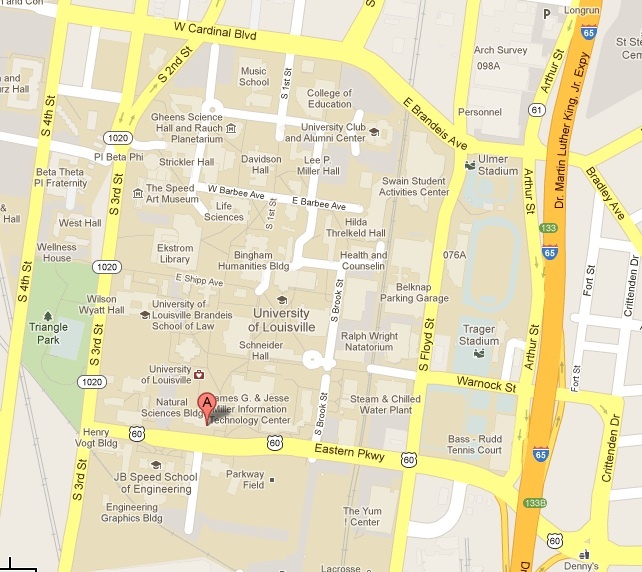 Campus maps for the University of Louisville are also online. On the linked map for Belknap Campus, the Natural Science Building is number 34 while the Shumaker Research Building is number 4 and Ernst Hall is number 33. For most visitors, the best strategy will be to take I-65 or Crittenden Drive to Eastern Parkway. For some, particularly visitors from the West End area of Louisville, the strategy will be to find 3rd Street and follow it to the University. Specific directions, coming from the north on I-65, can be found here. Specific directions, coming from the south on I-65, can be found here. The 3-letter code (used by most airlines and online travel services) for the Louisville airport is SDF. The airport is a five-minute drive from the University, and only a few minutes more from downtown Louisville. If you are trying to drive from the airport to the department, you should follow the exit to I-264 WEST. Stay in the right-hand lane(s) which diverge off to Crittenden Drive north. Follow Crittenden Drive north approximately 1.5 miles to Eastern Parkway (there is a Denny's on the corner). Turn left onto Eastern Parkway and follow the directions for those traveling from the south on I-65.